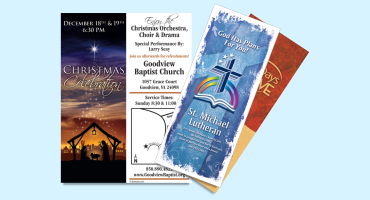 Have Your Church Bulletins Delivered Automatically & Get Free Shipping! 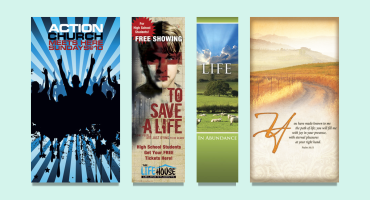 Outdoor Horizontal Banners are a great way to invite and direct passing traffic to your church! Every outdoor banner is printed on heavy 15 gauge vinyl with fade-resistant inks so they hold up in harsh conditions or through years of use. 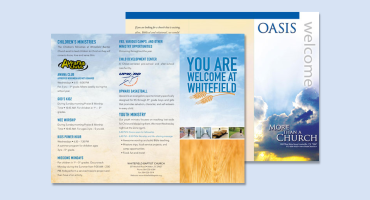 Outreach also offers great options for displaying your banner - learn more. Mount the frame on your wall, then quickly and easily switch out the artwork whenever you need to. Have a Great Idea or a Specific Design Need? If none in the extensive list of Outreach designs are right, you can still get fast, friendly and economical help from an Outreach Designer. 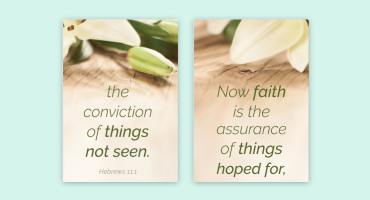 Our proven team of professional graphic designers work with churches every day and can help turn your idea or theme into the perfect design and product for your church. And our state-of-the-art equipment ensures that your final product will look great! 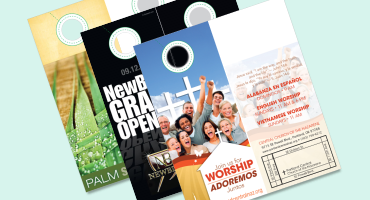 From postcards, to banners to bulletins or brochures - any tool can be created just for you, just select what you want above. Complete the Project Information Form. Here, you can describe in detail what you want on your design and what text you would like to use. You can also upload a rough draft, upload your logo and attach any additional images. After completing the Project Information Form, simply add the custom product to your cart. We'll contact you to confirm the details of your order and confirm with you that we're ready to begin design work on your project. You will receive an email proof of your project. To keep your project moving in a timely manner, it's important to review your proof quickly and respond with any changes or with your approval. 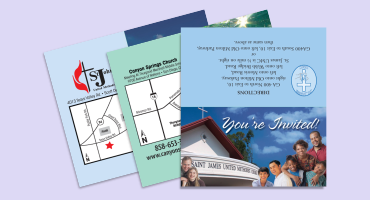 Your custom design includes 2 rounds of proofs. Once you have signed off on your proof, we will quickly print your project and ship it to you. LOVE being able to order on line and customize the banner. Great search and fast when I input the BN #. Clean, easy to follow pages. Not cluttered and distracting. I got stuck on how to open the text box, but the Quick Guide was quick and easy to follow and got me right back on track. Loved how quick and easy the process was. Thank you for adding the online capability. I love your company. 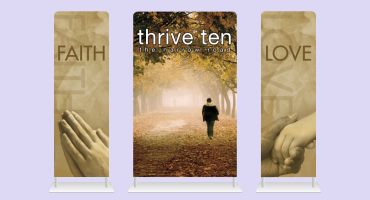 I thank the Lord for all the resources you provide for evangelism, outreach, discipleship, and so much more! You have been a source of great blessing as I serve as a teacher in our school, in youth ministries, and as our outreach chair at Zion. I miss not having your business located in Vista, CA, anymore. It was closer, and I could save on shipping by picking up products, since you were in our neighboring city. May God continue to bless you in the New Year.